For sheet piling is a significant solution to some construction problems, steel sheet piles in today's project played an important role. However, the construction process is unavoidable, as some of the problems. Such as steel sheet pile construction, how the case, the leakage Problem occurs when dealing with it? Shun force of steel industry talk about how to save? The use of steel sheet piles for plugging, used in the ordinary practice of sheet pile applications, will be filled with butter-filled seams to play. This method can not achieve the desired results. Then we found an effective solution to this problem. The steel sheet pile is slid by the method of down-pumping the side slit of the steel sheet pile and in order to achieve the closed-down, HZ-water-stop steel sheet pile in the dry sand inserted in the suction connection of the The water pressure, because the large deformed joints near the jail are filled with a punch after the completion of the installation of the cotton has been installed in the prisons around the start of the pump. 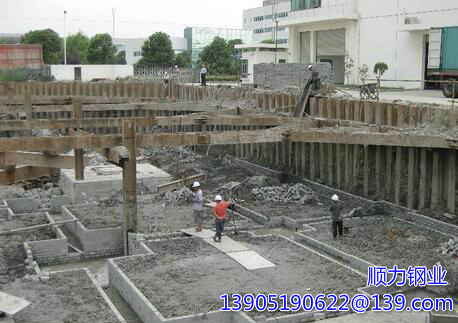 This technology has realized that the steel sheet pile effectively solves The leakage problem.